Yeah, yeah, there is no such prize category. But there should be! And the iPhone doesn’t need a prize, as it has already won the market. So, here’s the first nomination. 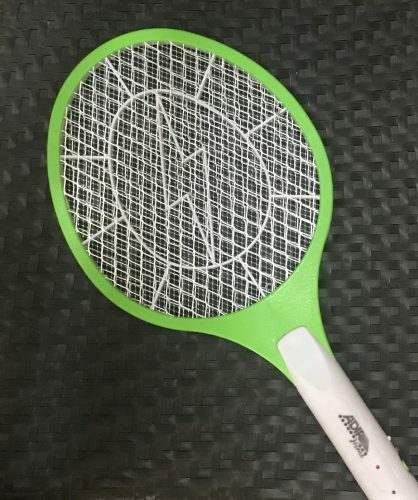 This little gem will help you tame the turf inside your house — and it gives such satisfaction to hear it bark and see it spark, when you connect with one of those evil bloodsuckers, mid-air. There are numerous brands and styles. I prefer the plug-in variety, as batteries seem wasteful. I always leave mine plugged into the wall so I know where to find it — it doesn’t hold much of a charge, fading after about a half-dozen kills. (Of course the best control is good screening of windows and doors.) But mosquitos get in when people enter or depart, so I sweep the area immediately. You can buy such racquets in larger grocery stores, from Amazon MX, and often at major intersections. They really work. In Spanish: raqueta de mata moscos. Good hunting! This entry was tagged mosquito control. Bookmark the permalink. Fun to learn about the history of the concept.